What Was I Thinking Here? . . . A Visit From A Creepy Santa. . .
Ok. . . so I remember this evening . . . seriously. We had just returned home from our Christmas Eve service. My dad was pastoring St. Mark’s Reformed Episcopal Church in Jenkintown, Pennsylvania. Our house was set directly next to the church. I was still wearing my little sport coat and tie. I can remember standing by the front door when the visitor you see me standing with here showed up. Here’s what I remember . . . The first thing I recall thinking was, “Santa looks a little different.” Looking not even remotely closely at this picture affirms my initial four-year-old assessment. The hair. . . the beard. . . the suit. . . the skinniness. . . and then the glasses. . . oh how I remember those glasses. Something was a little bit off. I couldn’t pinpoint what it was. . . but something was definitely off. What you can’t see is the low-to-the-ground close-to-my-four-year-old-eye-level little bit of attire that was what really set me off. Those aren’t the tops of Santa’s big old leather boots that you see there. They were like thin vinyl sleeves that were wide open at either end. On the lower end they partially covered the top of a pair of black lace-up dress shoes. I can remember thinking that something just wasn’t right. Funny thing about all this. . . 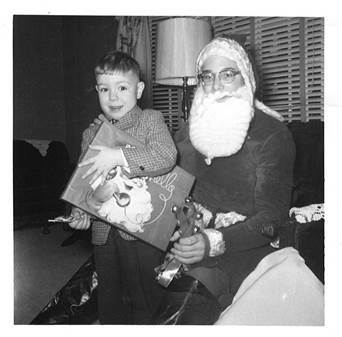 I remember thinking that Santa looked an awful lot like one of the young guys from our church. I’m also loving the look on my face. To be honest, I can only speculate on what I was thinking at the moment the flash bulb went off and the camera’s shutter opened. . . which, by the way, probably took my Dad about three to four uncomfortable minutes to set up while consistently telling me to “hold still!” (Any kid who grew up in the 1960s with a dad who took lots of pictures knows what I’m talking about here!). As I look at the picture today, I’m trying to looking into my facial expression and body posture to get a read on my thoughts. . . which, by the way, most likely went positive when “Santa Claus” handed me the package I’m holding on to for dear life. Am I thinking, “Who is this guy and why is he in our house with his arm on my shoulder?” Was I puzzled much-like Will Ferrell’s Buddy the Elf with the department store Santa who smelled like beef and cheese? Or, as someone who just saw this photo for the first time remarked, was I filled with excitement, wonder, and awe? I’m guessing the latter is what was going on. What this photo has prompted for me this year are wonderful memories of the joy of Christmas that a child feels. I’m excited to see that this year with my own grandchildren. In addition, I look at my young face and think back on the wonders that face would soak in during our annual Christmas Eve Candlelight service. Nothing but good memories of a message that changed and continues to change my life. I’m glad I found this wonderful black and white memory. Jesus said, “Truly, I say to you, whoever does not receive the kingdom of God like a child shall not enter it.” This Christmas as we celebrate the King who has come, I want to be that child. ← Christmas Communication. . . Insights As Your Family Gathers. . .